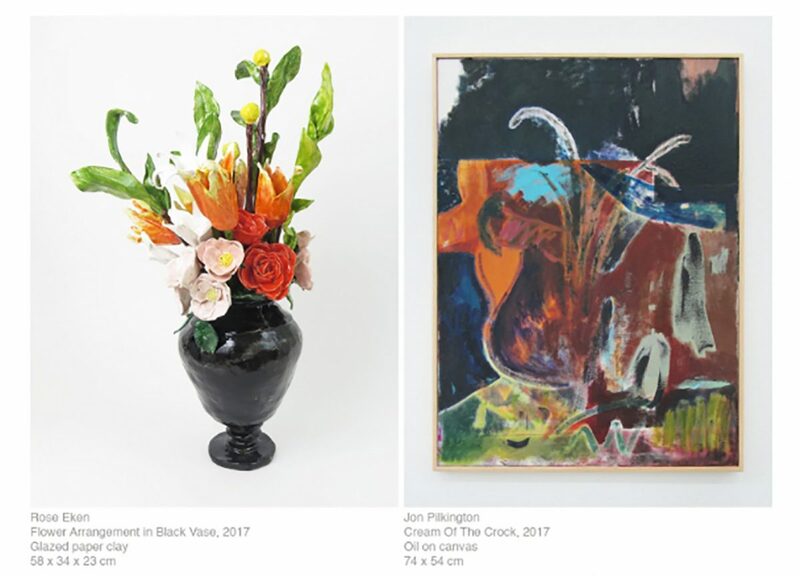 A juxtaposition of ceramic objects by Rose Eken (DK) and paintings by Jon Pilkington (UK). Both artists work with a common theme of displacement of form. A détournement of figure and a language of memory. The exhibition unfolds as a dialogue between the two artists. Rose Eken has created a large and extremely detailed ceramic Still Life table. The mesmerising tableau has references to 16th and 17th century european painting, but manages to update the tradition into the contemporary. Jon Pilkington’s paintings flank Eken’s installation. The new body of work from Pilkington is akin to a trip to a botanical garden for painting where uncharted species sprout from secret corners. Organic shapes twist from figuration to abstraction and vice versa. The collaborative exhibition was created on the occasion of Market Art Fair 2017, Stockholm.